Brock Lesnar is one of the toughest, most intense Superstars that WWE has ever known. From his first run in the company to his recent returns to everything in between, Brock has brought the pain every time he stepped into the ring. And now there’s nothing left to do. Well, almost nothing. It’s an issue we’ve seen before in Vince McMahon’s company. A veteran returns, he’s booked to the moon against the best and brightest that WWE has to offer and once he’s done, he’s done. Then it’s game over and he’s back to where he came from. And no, I’m not hating on The Rock. Relax. What I am a little frustrated with is how tiresome this routine has become. And it’s not that I don’t understand how it all works; trust me, I do. But that doesn’t change my frustration level at all. The fact is that Brock is a big name. He’s a very big name. And he needs to be utilized on a stage in which he can make the most money not only for WWE but for himself. That means Brock only faces other established veterans, guys who are also names that can match his star power. 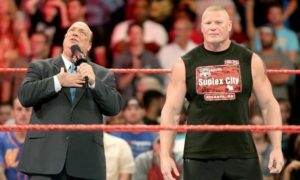 John Cena, Triple H, CM Punk, Big Show, Undertaker, that is the list of guys that Brock has faced since returning to WWE back in 2012. All of them were major Superstars and all of them were veteran talents with proven track records in the company. Lesnar was not used to put over younger guys, as has been suggested in the past. He’s just not that kind of star. He’s not Chris Jericho. Brock is in WWE for the big matches, the career defining bouts that will be shown on the network thirty years from now. The Beast is a prize fighter and he does not fight unless the match and the money is right. So that makes him a villain, right? I mean isn’t that what everyone thinks? Brock’s a money grubbing egotist that’s just out for a payday? But while everyone’s condemning him, the truth is that Brock is only doing what WWE needs him to do. He obviously wants to be there, if not why would he waste his time? Using him on TV every week may sound like a great idea to some fans out there but the fact is that Brock is not back in WWE for the championship. At lest not right now. That time will not come until later, perhaps later this year or early next year. And the only reason the title could be in play then is because The Rock will be back in time for WrestleMania 31. And The People’s Champ will need an opponent to either drop the belt to or win the belt from. Brock Lesnar is that man. Why? Because this is the only match left. Rocky is the only opponent left for Brock to work again. He is the only big name that’s still around, the only top talent that is still capable of having a good match on the worldwide stage. He is the last guy left that’s in Brock’s league, which means he’s the last one left that WWE can pair with Lesnar to make money. There’s just no one else. That’s why Brock is not coming back to TV every week. He just doesn’t need to and if he did, there would be nothing for him to really do. Lesnar is not the veteran that gives back to the next generation; doesn’t mean he can’t be he just doesn’t need to be. So while Brock Lesnar is awaiting the phone call to come back and pick a fight with another veteran, WWE fans are left waiting for something to happen. Brock, Taker, Rocky, Jericho, none of these guys are coming back full time and no one expects them to. So there re definitely spots open. And fans are waiting for them to be filled. They’re getting restless, because time is money and no one likes to get bored. So what’s taking so long? Where are the new stars, the guys to step up and finally have the guts to take WWE by the horns and make it happen? Where are they? Over the course of the past year, WWE has made one main event talent. Just one. Daniel Bryan is that talent. Yes, The Shield is successful and yes Bray Wyatt it killing it on the mic every night. But none of those fresh faces is ready for the big time just yet. None of them are ready to lead a deafening chant that spreads far beyond the confines of WWE and then deliver on the grandest stage of them all. So in the meantime we must be content with Brock Lesnar, who as of this writing is nowhere to be found. But when he does come back, you can be sure it’s because WWE wants him to. There will be another veteran to match him against because the fact is they’re just not ready to move on and start putting new guys into key spots. So no, Brock has nothing left to do. And yes, he will be used again anyway. We may understand it but that does not stop us from being frustrated.